A group of Latin American countries is trying to stop Libya's rebel government taking up the country's UN seat in time for next week's UN General Assembly summit, diplomats said Wednesday. Venezuela, acting for the ALBA group of countries, has written to UN leaders setting out the group's stance that Libya's UN seat should not be held by "an illegitimate transitory authority imposed by foreign intervention." 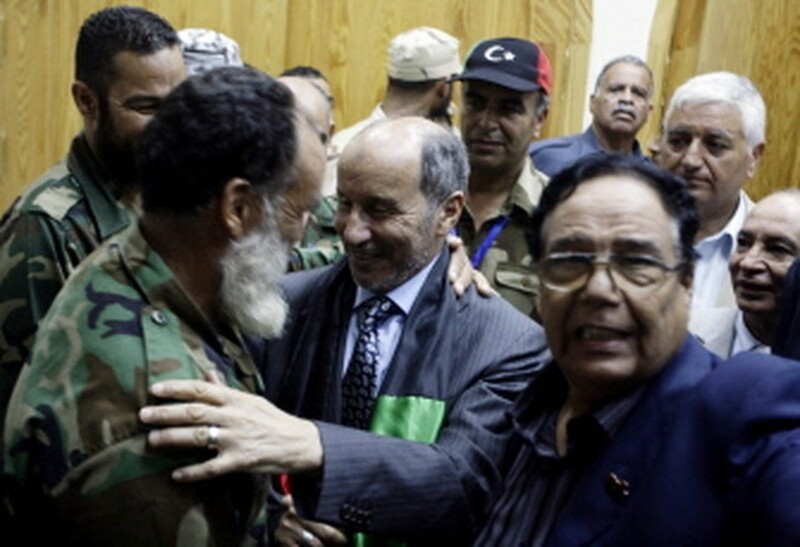 Libya's Libya's National Transitional Council Leader Mustafa Abdel Jalil is greated by the dignitaries of the town of Zawiya on September 14, 2011. The move comes as the UN General Assembly credentials committee discusses Libya's membership ahead of next week's gathering of more than 140 heads of state and government when the National Transitional Council hopes to make its international debut. The 193 member General Assembly may now have to hold a vote first to let the NTC take over the UN seat that is officially still held by the government of Moamer Kadhafi. Diplomats said the vote may be held Friday. Normally the credentials committee makes a recommendation which is adopted by consensus at the assembly. "This is clearly an attempt by the Latin group to stop the transitional council being at next week's meetings," said one UN diplomat. Venezuela's UN ambassador Jorge Valero sent a letter to the President of the General Assembly, Nassir Abdulaziz al-Nasser, setting out the opposition to the Libya rebels agreed by foreign ministers from Venezuela, Bolivia, Cuba, Ecuador, Nicaragua, Honduras, Dominica, Saint Vincent and Antigua and Barbuda at the ALBA meeting. "The seat corresponding to Libya at the United Nations should (not) be occupied by a faction or an illegitimate transitory authority imposed by foreign intervention," said the statement. ALBA called for "an in-depth debate" at the UN credentials committee on Libya's membership. It said this should be "aimed at preventing the occupation of the Libyan seat until a legitimate government is established, without foreign intervention, a government that reflects the free and sovereign will of the Libyan people." While more than 80 countries, including most of the major powers, have recognized the transitional council, the government of Venezuela's radical President Hugo Chavez remains a backer of Kadhafi, who is now in hiding. Parallel to the talks on recognizing the new government, UN Security Council members are discussing a resolution that would ease sanctions against Libya to help the government and set up a three-month UN mission in Libya.